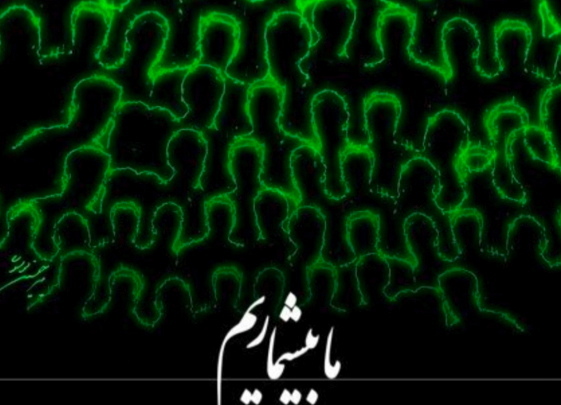 "We are Countless"—a design by Mir Housein Mousavi. Thank you all so much for your kind and encouraging messages. As you see, I have slowed the pace of these updates. This is not because the opposition to the election in Iran has dissipated. Rather it has moved to a new stage by expanding its horizons beyond the election results and to a more general demand for democratization of the country. While the opposition is diverse, I believe the Green Movement formed around Mr. Mousavi and Mr. Khatami continues to be the focal point of the activities. As I write to you, reports are coming in concerning demonstrations in the Bazaar of Tehran. That Bazaars are the heartbeat of the traditional economy of the country makes this a significant development. There have been eyewitness reports of at least three serious injuries and a number of arrests. I dedicate the fimage of this window, a personal design by Mr. Mousavi called “we are countless” (above), to these protesters. Mr. Ahmadinejad delivering his inauguration speech after the swearing in ceremony. Many prominent politicians and high ranking clerics refused to attend the ceremony. * There were more than 5,000 security forces present around the houses of the Parliament in Baharistan Square where Mr. Ahmadinejad was sworn in. * Train operators for the Tehran Metro system were reportedly ordered not to stop at Baharestan and Melat stations, citing security concerns. * Still, people gathered and chanted anti government slogans. Mr. Ahmadinejad arrived in a helicopter (another first in the history of presidential inaugurations). His camp has since denied this claim suggesting he traveled by car to be “among his people.” Interestingly, no photos of him “among his people” have appeared in the Iranian press so far. * Many members of the parliament were absent. Some left as soon as Ahmadinejad began to speak. In fact, many seats were empty and had to be filled with guests invited by Ahmadinejad’s party. * Among those absent were prominent clerics and political leaders such as Hashemi Rafsanjani, Khatami, Mousavi, Karroubi, Nateq Nouri, Mohsen Rezai, Ghalibaf, while many international guests and ambassadors also avoided the inauguration. Ayatollah Khomeini’s grandson did not attend the ceremony either. * In his speech, Mr. Ahmadinejad mocked the world opinion by suggesting he does not care about the approval or disapproval of the governments that do not congratulate him on his victory. * He compared the opposition in Iran to gard o khak (“dust and dirt”) usually raised by a passing wind. * Among the arrested was Haleh Sahabi, an activist and daughter of Ezatollah Sahabi who is the manager and editor of the banned newspaper Iran-e Farda. Hale Sahabi is a women’s right activist and reports indicate that she was assaulted by plain-clothed individuals and arrested. * Mr. Ahmadinejad is now embroiled in a huge fight with Mr. Ali Larijani, the speaker of the parliament, who criticizes his choice of ministers. 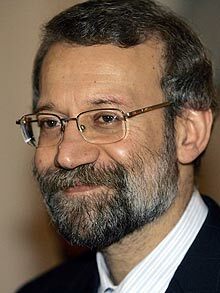 More importantly, according to information published on an insider web site http://rajanews.com/, Larijani had congratulated Mousavi on the eve of the election. He has access to the highest levels of power in the regime. What did he know about the election that made him do that? 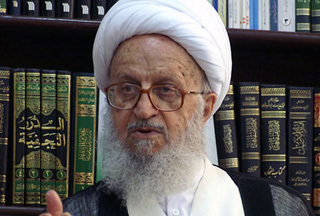 Ayatollah Makarem Shirazi has not Congratulated Ahmadinejad! * Following rumors spread by state-run media that the influential Grand Ayatollah Makarem Shirazi had congratulated Mr. Ahmadinejad, the office of the Ayatollah issued a statement clarifying hat he has not congratulated him and “will not do so”: http://mowjcamp.com/article/id/12060. * In a effort to tighten his grips on the Intelligence Ministry, on August 10, Mr. Ahmadinejad fired four of the senior officers in this ministry. Reportedly, they did not support his “velvet revolution” theory with enough zeal. 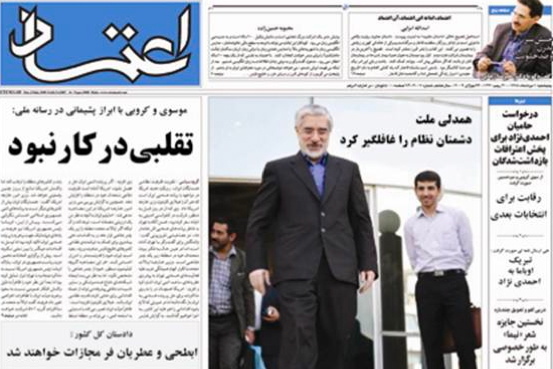 * Apparently one tactic to get the prisoners to confess is distribute fake newspapers in the prison with headlines that suggest the crisis is over, the protests are finished, Mousavi and Karroubi regret their actions, and the world is accepting Mr. Ahmadinejad’s government. Below is a photo of one such fake news paper. 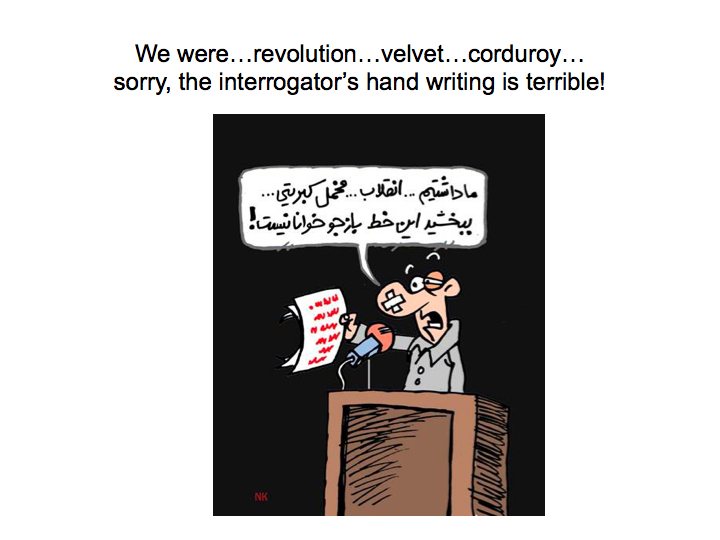 * The trials and forced confessions seem to be hurting no one more than the government itself. While open surveys cannot be done under the circumstances, general views expressed by the public indicate the majority do not believe the authenticity of the trials. * Amy Goodman’s interesting conversation with the leading Iranian dissident Akbar Ganji on the latest events, including the trails in Iran: http://www.democracynow.org/2009/8/10/iranian_dissident_journalist_akbar_ganji_blasts. Don’t forget to share the address of the blog http://www.windowsoniran.wordpress.com with friends. Protest in Baharistan Square tomorrow! See the link on the left for more information and directions. Much has been happening in Iran in the recent days. Let us open window 88 without further ado. * The Green movement has planed a peaceful protest rally tomorrow, August 5 at 9:00 a.m., in Baharistan Square where the Iranian Parliament is located and Mr. Ahmadinejad’s new term in office will be inaugurated. For the flyer with directions in Persian, click here: http://www.mowjcamp.com/article/id/9018. On Monday, August 3, Mr. Ahmadinejad was appointed to office by the Supreme Leader who traditionally performs this ceremony for the winner of presidential elections. * There are at least half a dozen demonstrations clips but I don’t want you to miss this one posted on line hours after the ceremony. The old lady says, I am 85 years old, I have come to this rally to take my vote back: http://www.facebook.com/video/video.php?v=102538009756701&oid=45061919453. * Italians have been expressing their support for the Green Movement in Iran since the election. Last week in fashion show in Rome Gattinoni models wore green wristbands to show their solidarity (see photo below). Last week Gattinoni models in Rome's fashion show wore green wrist bands to show their support for the Green Movement. * In the meantime, the Iranian rowing champion Mohsen Shadi, who won the gold medal in an international competition in Czechoslovakia, also wore a green wristband. But the Iranian-run Press TV did not like that and cut off his wrist (see the photo below for yourself). 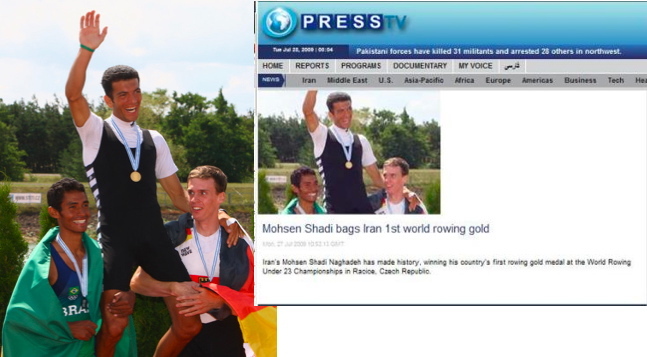 Mohsen Shadi's green wrist band is conveniently cut out of Iranian-run Press TV's photo from his recent gold medal win at the international rowing championship. See the original picture on the left and the Press TV picture on the right. 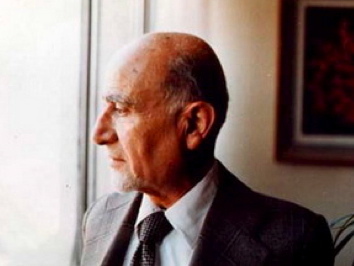 Mehdi Bazargan, the first Prime Minister of Iran after the 1979 Revolution. Let’s Go Iranian on Him! This is a cool piece of news I am sure Iranians would very much enjoy. * A new issue of the Newsletter “The Green Word.” For Iranians who might not be able to open the link, here is the pdf file: Kalame Sabz-July PDF File. Please remember to share the link https://windowsoniran.wordpress.com/, particularly with those who are in touch with Iranians. 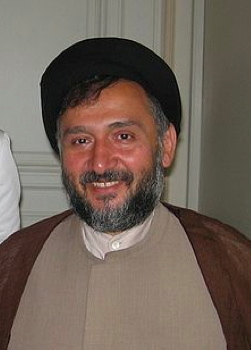 Mohammad Ali Abtahi (above) is the former Vice President of Iran as well as a leading reformist politician who has dedicated much of his time recently to interfaith and intercultural activities. He visited Washington University in St. Louis last year and even appeared on "The Daily Show" with Jon Stewart this year. Click on the link below to read more about him and see what he looks like now after more than forty days in jail. The Iranian authorities have started a series of staged confessions to accuse those arrested after the election as supporting foreign sponsored plots to overthrow the government and create a “velvet revolution.” One of the main targets of these trails are reformist politicians. * One of the first victims of this sinister move is a pro-democracy, interfaith activist, and a high ranking official in the government of Mr. Mohammad Khatami the reformist ex-president of Iran. Mr. Abtahi visited Washington University over a year ago. I attended the breakfast given in his honor and developed a deep respect for him. He was arrested soon after the election and kept in solitary confinement for over 40 days. His trial took place today. * I will not publicize what the court wants people to hear. However, with a heavy heart, I have put together a short power point slide show so you get to meet Mr. Abtahi for yourself and also see him in court. 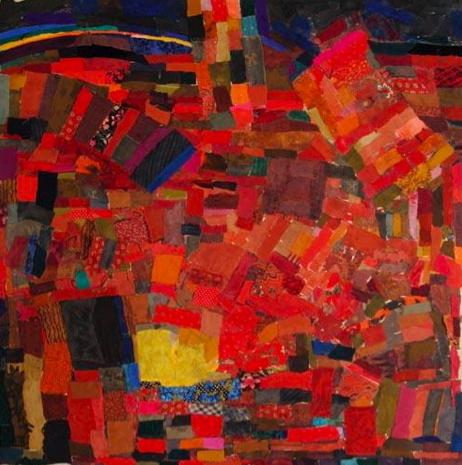 Please click here: Mohammad Ali Abtahi Slide Show. 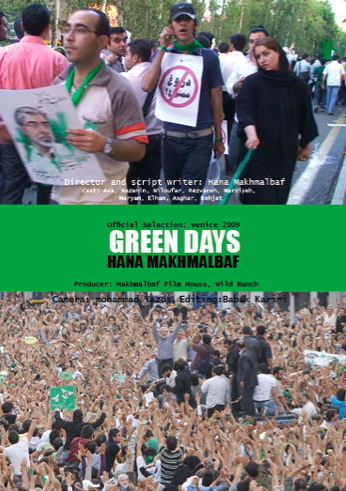 Also please visit his blog (in English) http://www.webneveshteha.com/en/ and/or (in Persian) http://www.webneveshteha.com/. Please share this window with others particularly if you have friends in Iran — and don’t forget the blog: https://windowsoniran.wordpress.com/.